Grandchildren add noisy joy to the holidays and every season of the year! The Christmas mitten: our four grandkids personalized Christmas ornament in its festive red cheer is a wonderful way to celebrate those grandchildren - and it makes a meaningful personalized grandparents gift too. Give us their names and compose a special sentiment for the recipients, and we'll add them where shown, but we'll use a hand-painted font for customization. 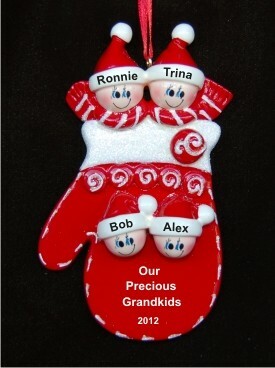 These large grandparents ornaments personalized to be cherished keepsakes are among the many we offer, so you'll enjoy finding others that can be used to create a theme this season. 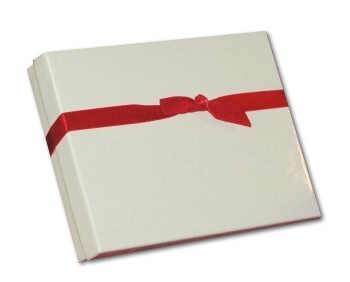 The red mitten 4 grandkids ornament arrives in our beautiful velvet drawstring pouch. For mom from my kids Dec 27, 2014 Jennifer B.